Posted at: 1/22/2012 10:55:00 PM . Even though I currently live in the city of brotherly love, Philadelphia, I am a New Yorker born and raised. My home team will always be NY and my mailing address cannot change that. The Yankees had an awful year but at least one New York team is playing strong. The New York Giants won tonight's game which means (say it with me) THE GIANTS ARE GOING TO THE SUPER BOWL. I might actually watch the game this year instead of just the commercials. Keep an eye out, because I'm sure we'll be seeing lots of coupons and deals for party supplies as the Super Bowl gets closer. 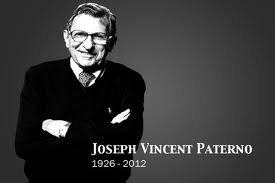 On a sadder note, an official statement was released this morning that beloved Penn State football coach Joe Paterno has died from complications of his cancer at the age of 85.